Touhou Genso Rondo: Bullet Ballet has the unenviable position of being the first game in the Touhou Project series to see an official Western release. As a fan-made spin-off of a franchise with a rather niche following, especially outside Japan, it’s an odd candidate for localisation. It was the first Touhou game to get a console release so I can see why it was chosen, but in Japan it was released to an audience at least vaguely familiar with Touhou, which is much less the case in the West. The series has been around for 20 years, and it spans 20-odd main games, and a multitude of side games, and hundreds of officially-endorsed fan projects. It’s expansive, to say the least, and with that comes a breadth of lore and narrative complexity that Bullet Ballet just assumes you’re acquainted with. There’s a Story Mode, but it’s similar to most fighting game story modes in that it’s a series of brief, context-less exchanges that lead into battles. If you’re not familiar with Touhou, these stories make absolutely no sense, which is disappointing given how interesting this world and its characters appear on the surface. The series’ broad, overarching plot revolves around a hidden realm where shrine maidens fight yōkai, but frankly, I couldn’t tell you more than that – and Bullet Ballet certainly hasn’t helped matters. To be fair, as a hybrid fighting game / bullet hell shooter, Bullet Ballet is not exactly a story-driven game, but this alienating narrative is frustrating nonetheless, especially when a few pages of backstory would have been sufficient. If you can get past that, there’s an interesting game in Bullet Ballet – though, again, it’s far from welcoming to strangers. It’s basically a 1-on-1 shoot ‘em up (or “shmup”): instead of weaving through carefully choreographed waves of enemies, as is the case in most shmups, it’s you against another person, with your attacks forming the curtains of bullets that the other player has to dodge, and vice versa. It’s a fascinating mash-up of genres that works beautifully. In a typical shmup, enemies’ attack patterns are carefully designed so that they’re difficult to overcome, but not impossible – even when the screen is inundated with bullets, there’ll always be a way through. This is true of each character’s individual attacks in Bullet Ballet – in fact, on their own they’re quite easy to avoid – but a key strategic element comes from combining these attacks. Trying to create bullet patterns that are as complicated as possible is a cornerstone of your offensive efforts. When two skilled players are going at it, this creates a scene that’s truly something to behold. “Bullet Ballet” is an apt title, because even though the goals of the game are fundamentally adversarial, the end result is an elegant, majestic dance. Through their competitive efforts to come out on top, the players are also cooperating, in a sense; they’re working together to paint something beautiful. Of course, that all assumes the players in question are highly adept. In combining the twitch mechanics of shmups with the tactical depth of fighting games, Bullet Ballet is a game with a very high skill ceiling, but sadly, it does little to welcome new players into the fold. A brief tutorial that doesn’t even give you a chance to practice the things being taught is the only means of an introduction – after that, you’re on your own. Shoot ‘em ups are notorious for their difficulty, and in its handful of single-player modes, Bullet Ballet is no exception. Story Mode starts out easy but ramps up exponentially after a couple of levels, and as a mode designed to challenge even skilled players, Boss Rush takes that to another level. Again, this is where Bullet Ballet is an odd choice for Touhou Project’s first Western release. It’s a game made by fans for fans, so it makes a lot of assumptions about the audience’s familiarity with Touhou. In Japan, where the series has a footing, that’s fair enough, but in the West, it’s probably a fair assumption that most players don’t have that familiarity. Unless you’re well-acquainted with Touhou or bullet hell shooters in general, Bullet Ballet is a trial by fire, which isn’t great for the first widely-available game in the series – a game that should, ideally, be accessible to the huge new audience its trying to reach. The good news is that there are at least two more Touhou game heading West: Touhou: Scarlet Curiosity and Touhou Genso Wanderer. They’re both RPGs that are much more story-driven, so they should be a bit more welcoming. Bullet Ballet is aimed very much at seasoned Touhou players, so it’ll only benefit if those other games can build the fan-base. But when it’s the first – and only, for now – game in the series to get a Western release, Bullet Ballet‘s opacity makes it a poor introduction to Touhou Project. 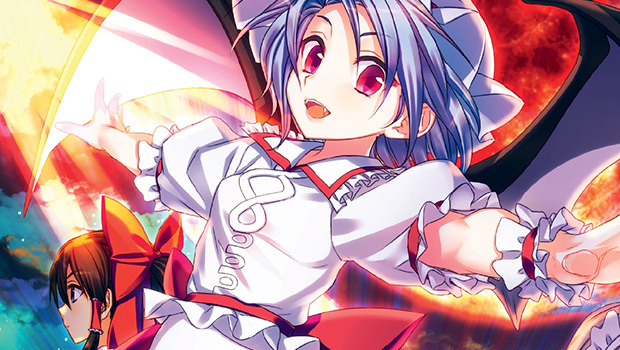 Touhou Genso Rondo: Bullet Ballet is developed by CUBETYPE and published by NIS America. It’s available now for PlayStation 4.